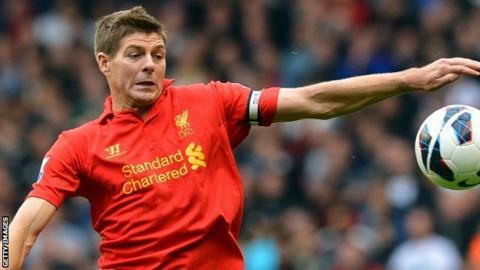 Liverpool captain Steven Gerrard has likened Everton to Stoke, claiming their rivals used long-ball tactics during Sunday's Merseyside derby. The Premier League match at Goodison Park ended 2-2 after Luis Suarez's late 'goal' for Liverpool was ruled out. Gerrard, 32, said: "Every single time they get the ball to the goalkeeper it comes in long. "There was only one team who came to play football and that was us. Everton are not better than us." The statistics, however, showed that Everton enjoyed greater possession, made more passes and completed proportionally fewer long passes than Liverpool. Gerrard added: "I thought we were fantastic and stood up to a team that are very similar to Stoke. "Everton are effective because they have some big, physical lads in the team. We had a young, small team out there who were men and stuck together." The draw lifted Everton to fifth in the table. They are seven places and six points ahead of Liverpool.